We had a wonderful nature walk at Herrontown Woods on April 6, led by Hopewell science teacher Mark Manning. Mark had been exploring the preserve with his son in recent years, and had reached out to the Friends of Herrontown Woods to share his findings about the amphibious life in the preserve. The day began cool and wintry, as we gathered around one of the vernal pools just down from the parking lot. We wondered what there would be to see, since one of the main attractions, the adult frogs we'd seen a week prior, had disappeared back into the woods after laying their eggs. As Mark explained the remarkable behavior of wood frogs--their capacity to remain frozen for long periods in the winter, the frenzied ritual of spring mating, the symbiotic relationship between their egg masses and an algae--we picked up a few eggs from the pool and found that the tadpoles were already hatching. There was layer after layer to Mark's fascinating descriptions, as he found other amphibians under leaves and rocks. 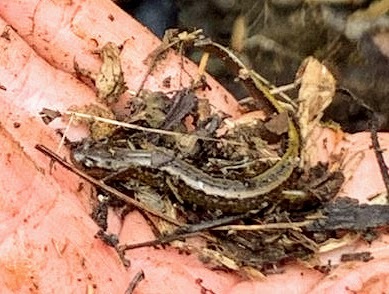 Among the finds were 2-lined salamanders and red-backed salamanders. They are improbably light, soft, skinny creatures to hold. This photo was taken just before the salamander crawled up under the boy's sleeve. We had ventured no more than a few hundred feet from the parking lot, but Herrontown Woods' charms were already beginning to draw us in. This is probably the cleanest stream in Princeton, as nearly all its headwaters are preserved as part of Herrontown Woods. Each rock has its own pattern, decades in the making, as animate and inanimate worlds seem to merge and collaborate. or mushroom. Peter Ihnat, who came on the walk, shared some of his knowledge of these "turkey tails" and other mushrooms. Under some leaves, Mark found salamander eggs (the small white dots in the lower left, while the salamander's tail can be seen at the upper right of the photo). Talk periodically shifted to the plant world, with Mark describing the incredible hardness of musclewood, and its applications. Under two towering tulip trees, Mark pulled out some rope he and his son had made from natural fibers. He then proceeded to make rope from the bark of tulip tree, using a "reverse twist two-ply" method. We then headed over to Veblen House for refreshments and socializing. As we were gathered next to the house that Oswald and Elizabeth Veblen once called home, one of the kids who had been quiet all morning said to me, "I wish it was still a library. I love libraries." It melted my heart. That was the original wish of the Veblens, stated in their will, yet not acted upon. Forty five years later, our nonprofit is seeking to realize theVeblens' generous vision, and also use the house as a museum and meeting place for talks and music. Though the walk covered just a couple of Herrontown Woods' shorter trails, we felt like we had come a long way. Mark Manning's insights had opened up new worlds for us, especially for the three kids who came along. The day, too, opened up, beginning cool and cloudy, then warming as the sun broke through. Over the course of two hours, we felt like we had walked from winter into spring. 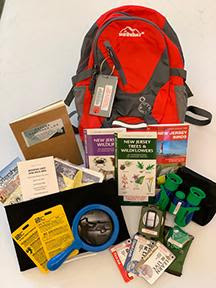 Thanks to an initiative by board member Inge Regan, the Friends of Herrontown Woods contributed leaf identification cards to the Princeton Public Library's new explorer backpacks. Some of the photos and text on the leaf ID cards can also be found at this link. Thanks to Princeton's Ace Hardware for donating their unsold spring bulbs to the Friends of Herrontown Woods! FOHW's vice president, Perry Jones, coordinated this donation, and helped fill up the back of Old Green with the partially filled boxes. The bulbs will help recreate the english garden that once graced the grounds of Veblen House. 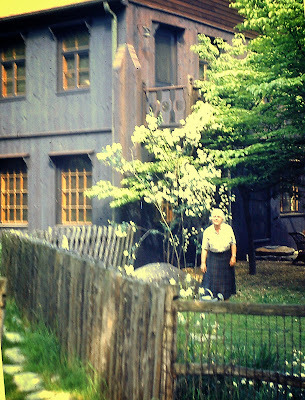 Fortunately, we have photos of what the grounds looked like in the 1950s, while the Veblens were still alive, supplied to us years back by longtime resident of the Veblen House, Bob Wells. The photos show a clear emphasis on tulips, daffodils, and primrose. Elizabeth Veblen no doubt inherited her love of gardening from a youth spent in England. Now is the time to identify all the boulders in these photos. That's Elizabeth in the photo, enjoying a brisk spring day, with daffodils holding forth along the edge of the field. The grounds were taken care of by Max Latterman, who had first worked for the Whiton-Stuarts before the Veblen's bought the house. These low-growing yellow flowers are winter aconite, not to be confused with the closely related but highly invasive lesser celandine (also called fig buttercup). The split rail fence that formed an oval around the Veblen House was planted with lilies and peonies, with fruit trees nearby. Some posts from that fence remain standing, due to having been made of rot resistant black locust. Another photo with Elizabeth posing at the back of Veblen House. One of the house's two balconies, possible added by the Veblens, the better to view the garden, can be seen just up and to the left behind Elizabeth. Looking the other direction, towards the Veblen Cottage from the back side of the house, this photo shows the curious structures that once graced the grounds: a dovecote and a hay barrack. A dogwood tree, tulips and primrose, all cared for by the Veblens, her friends in the Dogwood Garden Club, and longtime caretaker Max. The son of the Kennedys, who lived nearby, said that going to the Veblen House felt like walking into a Beatrix Potter story. In winter, light floods the forest and vistas open up, with hints of dormant potential all around. It's a good time for a walk in Herrontown Woods. Halfway up to the Veblen Cottage, along the trail from the parking lot off Snowden Lane, is a small grove of trees with dark, knobby bark. Stop where the trail bends around the corner of a fence, look around you, and you'll see them. A couple have fallen, but five or six trees remain. These are native persimmons, a mid-sized tree struggling to compete for sunlight with the red maples and ash all around. Some may know the Asian persimmons with apple-sized fruits, grown in a few yards scattered around town. The native has smaller fruits that are extremely sour until they ripen into a rare and fleeting sweetness. You can see in this photo that the persimmon has a very narrow crown, claiming a small patch of sky in the canopy far above. The nearest twig and bud is 50 feet up this slender trunk. Persimmons are dioecious (dye-EESH-us), which is to say that there are male trees and female trees, with only the females bearing fruit. Other dioecious woody plants at Herrontown include spicebush, Kentucky coffeetree, and winterberry. There is or was at least one female persimmon here, because I once found a fruit lying on the ground next to the trail. Standing next to one of these trunks, the tree can feel close and remote at the same time, with so much of its business being conducted out of sight, high above or underground. Far more reachable is another special, much smaller and more easily known tree just a few feet off the trail, growing underneath the persimmons. Look for a cluster of tan stems growing out of the ground near the rock wall and you'll see a hazelnut tree. A big ash tree fell on it a few years back, and we cut away portions of the stem so the hazelnut could grow unhindered. Whereas some kinds of tree are found throughout the forest, hazelnuts tend to be loners. Though the Friends of Herrontown Woods has planted more of them at Veblen House and the botanical garden, there are only a few hazelnuts growing naturally in the preserve, each far from the others. The many-stemmed plant doesn't appear distinct until you look more closely. These are the male catkins that will open later in the winter and early spring to release their pollen. Continue up the path (the path is currently being rerouted to go through a pleasant grove of conifers near the cottage), and you'll emerge near the little red barn that is part of a farmstead built around 1875. Near the barn, and common elsewhere in the preserve, are spicebush. Look for shrubs with these small flower buds along the stem, then confirm by doing a scratch and sniff along the stem to smell the citrony fragrance that gives the shrub its name. Imagine early spring, a month from now, when small flowers emerge from these buds to create subtle clouds of yellow in the woods. The flowers quickly fade and by fall turn into sizable red berries rich with lipids for the birds. Now that deer culling has reduced the intense browsing pressure these and other native shrubs were experiencing a couple decades ago, the spicebush are flourishing, each with many stems emerging from the ground. Look more closely at one of the stems to see the speckled bark. Taking a left down the green and white trail, you may encounter a tree with what my mother called "black potato chip bark." Black cherries are mid-sized native trees that eventually get shaded out by taller species, but some are hanging in there at Herrontown Woods. Unlike the furrowed bark of ash and oak, the cherry's bark is platelike, with subtle horizontal lines in the "chips." Contrasting with the rough bark of most trees is the smooth, sinewy look of musclewood, also known as blue beech or American hornbeam. Each musclewood has a distinct shape, with this one achieving something akin to a pose in ballet. A short way into the woods on the right are the clustered stems of some very old witch-hazels. While the showy cultivated Asian varieties seen in town and at the university bloom early in spring, the native witch-hazel has a subtle yellow flower with four slender petals that emerges in late October, when most trees have gone dormant for the winter. In winter, the remains of last fall's flowers can be seen along the stems. Witch-hazels are fairly common in this area of Herrontown Woods, in moist seeps below the ridge. Further down the green/white trail, the yellow trail joins it from the right. Scan the forest and chances are you'll see pale brown leaves clinging to some of the trees. These are American beech trees, with smooth gray bark like the musclewoods but generally larger and without the sinewy look. A closer look reveals the long, slender coppery leaf buds. Scars where branches once were make distinctive patterns on the smooth bark of the beech trees. Not sure what caused these scars, but they almost look like a doctor stitched them up. These are a few of the many kinds of trees at Herrontown Woods, and as you look with a newly familiar eye for more of these new friends in the forest, wonder if the trees have been looking at you all along. The yellow trail follows the edge of a stream, which after many cold days and nights was frozen into endlessly varied shapes, with water flowing just beneath the molded crust. In some places, large bubbles could be seen traveling under the ice, their shapes constantly shifting and bending in the liquid current, flowing downstream like ghosts. Even in the day's fading light, still visible in water, rock, and wood is the endless variety of Herrontown Woods. It's been the best year yet for Herrontown Woods. 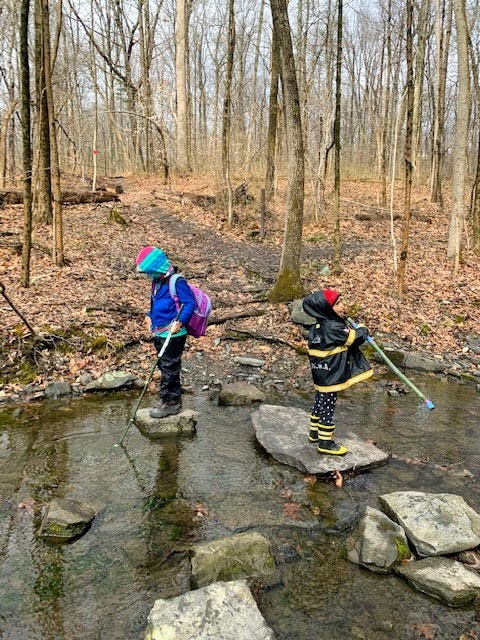 Through our advocacy, Herrontown Woods is now owned by Princeton, has a new addition of 7.5 acres, a newly planted botanical garden to acquaint the public with native species, ongoing restoration of trails and habitat, better protected Veblen House and Cottage, and funding for initial repairs. Our emphasis is on preserving and utilizing the Veblen's wonderful gift of land and historic buildings, and providing ways for the public to enjoy and learn about these natural and cultural legacies. Please support our work, and join us out at Princeton's first nature preserve. · Convinced Princeton to accept transfer of the 142 acre Herrontown Woods from the county, including the buildings. · Our advocacy was crucial in adding 7.5 acres of sloping woodland to Herrontown Woods, at no cost to Princeton. · Our work at Herrontown Woods helped prioritize acquisition by Mercer County of 4.5 acres of pasture next to Veblen House. FOHW is working with DR Greenway and Princeton to determine how this important grassland habitat will be managed. · Improved the buildings’ appearance and weather resistance by improving the roof tarps and painting the window covers. · New board members and some particularly engaged friends of the preserve are adding their energy and expertise to FOHW’s work. · Additional progress towards our initial goal of raising $100,000.